It will be apparent to most of you familiar with the Museum and this blog that posters are an important part of the Underground150 celebrations. It will also be apparent to regular readers of the volunteers’ blog that the vast majority of the Museum’s collection is actually kept at the Acton Depot. This is especially true for posters, with tens of thousands dating back over 100 years or so to the early part of the 20th century. Also at Acton Depot is a smaller collection of original artworks that were created in the production of the posters; however this numbers in the hundreds rather than the thousands. 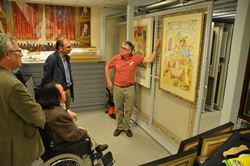 Recently I was lucky enough to join a private tour of the two collections organised for the Friends of the Royal Academy, guided by two of the Museum’s volunteers, Tom Cavanagh and John Dodd. I had keenly anticipated the event, being very interested in the poster collection myself. I also expected some illuminating questions and conversation, given the knowledge and interests of our guests. I wasn’t disappointed on either count. Both John and Tom gave well informed and interesting tours of both collections, visiting them in turn with a group of ten or so. They entertained us with an excellent knowledge and understanding of the collection, and were able to pull out relevant and interesting items that engaged the groups. I was particularly impressed with John’s discourse on lithography! Not all the original artwork is painted – the collection includes collage, mosaic and stencil as well as the water colours, oils, etc. that one might expect. It was also interesting to note that none of the visitors had a particular interest in transport; proof (if it were needed) that the Museum’s collections can appeal to a surprisingly wide audience. 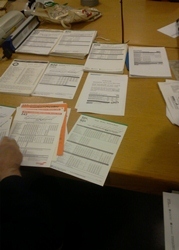 And what better way to learn about it than in the hands of an enthusiastic volunteer? A Happy Museum? Of Course! Museums are not just about their contents, important though the exhibits are. It’s increasingly recognised that museums have an important part to play in the well-being of people generally, and not just that of their normal visitors. 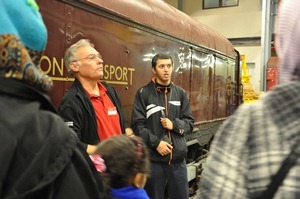 London Transport Museum keenly supports this view and is working to develop its services in less conventional ways. Indeed its very successful volunteer programme is an excellent example of an activity that benefits both the museum and the individual. Hence the “Happy Museum”: a programme that has been developed with a number of other museums (such as the Godalming Museum and the Story Museum, Oxford) to explore the opportunity for increased sustainability through wider and deeper engagement with all potential audiences. Funding for the “Happy Museum” has been provided by the Paul Hamlyn Foundation and Arts Council England, amongst others. One result of LTM’s engagement with the “Happy Museum” has been a project with St. Mungo’s, the homelessness charity, aiming to help excluded people engage positively with society. 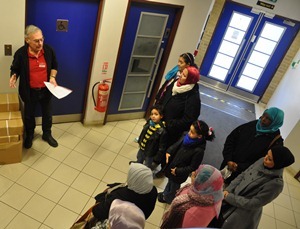 A number of potential volunteers for the project were identified by St. Mungo’s, and they met with LTM staff at an Open Day in late 2012. As a result a group of St Mungo’s clients have been engaged in voluntary work at the museum, working closely with the curators. 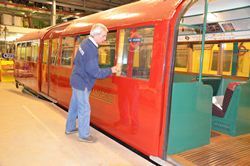 I met Chris Daniels at the Acton Depot one day recently, where he was busy cleaning a train of 1938 tube stock inside and out in preparation for the Acton Open Weekend. Chris also volunteers with St Mungo’s itself, and has been busy gardening; he confided in me that he was very glad to be working indoors on this particular (very cold) day. So was I! 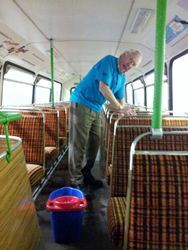 Chris told me that he had enjoyed his 3 months volunteering with LTM, and had been involved in bus cleaning as well for the open weekend. Although his working life had been in the water industry, he has always liked transport. In his own words, “I’ve enjoyed working here as volunteering people are family. It helps my state of mind, and it’s nice to meet other people.” A sentiment that I think many volunteers would echo. So, who are these keepers of the dark art of Underground signalling? The first thing to say is that some of the team were not at the Depot when I called by, so this post concentrates on the three that were. Don’t worry though, I’ll be back to catch up with the others before too long. First up is Mike Crosbie, the team’s designer. Mike did his engineering apprenticeship with Morris Motors in Oxford, and joined London Underground in the early 1970s in response to an advert for signalling engineers. You can see him above checking the wiring diagram for the Elephant and Castle restoration, designed by him from scratch. Having looked at the diagrams I can vouch for the fact that they are very intricate – they give a real feel for the painstaking accuracy required to deliver safe signalling. Peter Smith (seen with Mike above) is the odd man out, insofar as his career was in television engineering (with the BBC) rather than railways. He has been a volunteer with the museum for some 18 years, and with some modesty describes himself as a “willing pair of hands”. 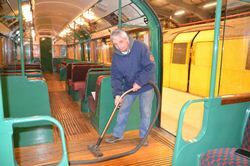 In his time with the museum he has done bus cleaning, enamel sign mounting and restoration work on standard tube train stock. Bill Collins (above) has signalling in his blood: he has been a volunteer for four or five years now, but started his working life as a fifteen year old office boy in the signalling department at Earls Court, before becoming an apprentice. Subsequently his entire career was in metro signalling (not all with London Underground). Bill became a volunteer because he enjoyed working with signals so much. What is it that has kept this hard-working team so close? To a man they said it was the camaraderie, coupled with a good sense of humour – essential! Roughly every month there is a volunteers’ working party at Acton Depot, so with keen anticipation I made my way to the depot on the 23rd October to see what one involves. On arrival I tracked down Robert Excell, the Curator in charge of the day’s event. Vehicle cleaning was the order of the day, and I found Grey Green Volvo Ailsa VA115 ready for a thorough sprucing up. Upstairs wielding an expert mop and brush was Jerry Pratchett, burnishing a floor that you could eat your lunch from. Jerry has been a volunteer for more than 15 years, his interest in transport being sparked by his father who worked on the buses at Hendon. Conversely, downstairs I found a volunteer who had a long career on the buses: Malcolm Bowers, who started his career with London Transport and finished with Arriva. I found Malcolm busy giving the downstairs seats a thorough hoovering. A clean interior demands a clean exterior. At Acton washing is done by hand as there’s no drive-through washer. 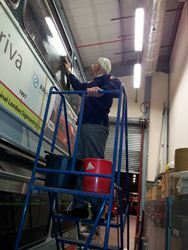 Whilst I was inside VA115, Ron Bristow had arrived, and was preparing to start the external clean. A volunteer for 20 years, Ron has been involved with many activities, such as guiding and museum moves. I can tell you that I was starting to feel a bit of a novice at one month’s service. To prove that it isn’t just about the buses, Robert Bedford was found busy with the vacuum cleaner inside the recently acquired A60 stock car. After 51 years in service it probably needs a good clean! Robert has been a volunteer for about a year, and already has a varied list of interesting activities. Once again I came away from the depot very impressed by the volunteers’ contribution. “We are currently wiring up the two frames (Eastbound & Westbound) that will go into the equipment cabinet that will allow us to control Marble Arch frame. We then need to connect the equipment cabinet via multicore cables to the frame & diagram plus train description and miscellaneous items to the frame. We have all the items we need and are making good progress towards March 10th (Our next Depot Open Weekend). I’m not yet convinced that we will have all up & working by then but we do have the computer side of things already done and tested. This allows us to test our items but most importantly allows us to ‘produce’ trains, and then via the Signalling frame allow them to run through the station or terminate and reverse west to east via the siding. After a couple of sessions with the Museum’s Friends and volunteers, and some great editing by film maker Geoff Marshall, the first round of Depot Discoveries films is now available to view on YouTube! Head over to www.youtube.com/ltmuseumvideo to check them out, and let us know what you think. Our next Depot Open Weekend is taking place on March 10 and 11. We’ll be making the most of this opportunity to trial out accessing these videos, so be sure to bring your smartphone or device with you on the day. Around four objects will be marked with new Depot Discoveries labels, featuring QR codes for you to scan, and I’ll be around with some trusty volunteers to hear what you think of the interpretation scheme. We hope to have Wi-Fi access available too, making it even easier to get online whilst in the store. Many thanks to those of you who have contributed so far. If anyone would like to feature on camera as part of this project, get in touch with me at jennifer.kavanagh@ltmuseum.co.uk and we’ll get planning! 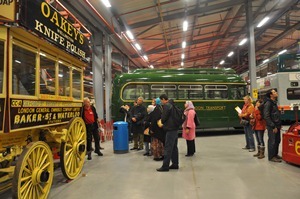 On Wednesday 30th November one of our esteemed volunteers, John Campbell, gave a tour of the museum’s Depot in Acton. The tour was given to a group of students who are using our collection as a starting point for learning English and improving their confidence with travelling on London Transport. 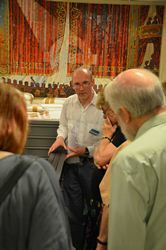 Having given tours on the museum’s collection for a number of years, this was the first time John had given a tour to a group to whom the majority had English as a second language. 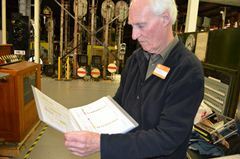 This made the tour quite different from the usual, as John became quite animated in describing the history of some of the vehicles, and regularly asked questions to the group to keep them engaged. The group became so comfortable with the tour that it turned very quickly into a Q&A session led by the group! 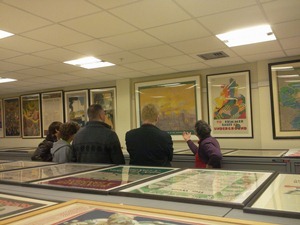 John also spent time showing the group our extensive art and poster collection, which everyone was very keen to see. As part of their course the group were studying a number of our posters, so it was a great opportunity for them to get a first-hand view of the works whilst being able to ask their guide any questions they had about the collection. 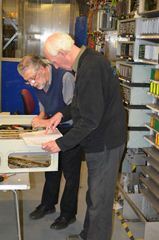 On Thursday 3rd November volunteers were present at the LTM Depot in Acton to assist the curatorial department with sorting and accessioning ephemera material to add to the collection. 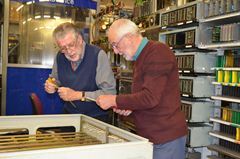 The Museum receives a vast amount of material through public and private donations, and volunteers are on hand on a regular basis to help out. 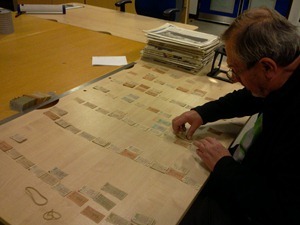 Fred Ivey assisted with checking bus timetables for duplications which had recently been donated to the museum, with timetables ranging in production dates from 1965 through to 2005, so there was plenty to keep him busy with. 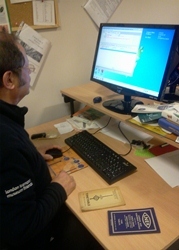 Brian Hawkins meanwhile took on the task of adding timetables to the collections IMS system, so that they could be officially logged and searched for by our curators to assist with future queries and museum research.